My work focuses on the exploitative relationship people have with the natural world and how this relationship shapes the manufactured landscapes around us…. [The] two-dimensional work is executed on stained and finished wood panels reclaimed from cast-off or broken furniture. Employing reductive intaglio techniques from my printmaking background, I use tools like scrapers and engraving burins to remove the layers of old finishes, stains, and veneers with the objective of adding as little as possible back onto the piece. Just as nature is reduced to create these objects, I further reduce the objects to reveal their true nature. 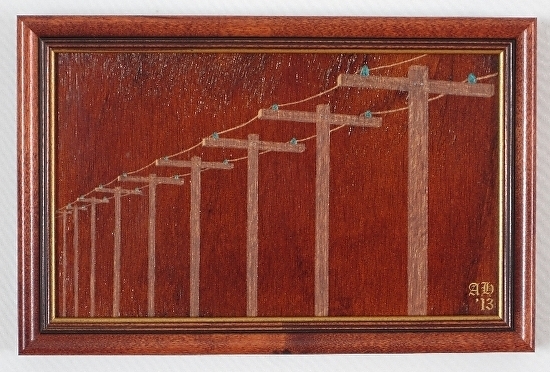 As with Michael Paul’s haunted painting “People talking without listening“, Hendricks’ marquetry draws on the ubiquitous telephone pole, in this case its rhythms along country roads or the lengths of urban alleys, representing a communication mode on the list of endangered technologies—if not those already extinct. Viewers under the age of, say, twenty-five, are likely to find little meaning in their repetitive cruciform shapes. For others “of a certain age” these will conjure memories of Burma Shave signs.